Meet Our Team - Zeeland Veterinary Hospital, P.C. Dr. Vanden Bosch is from the Zeeland area. 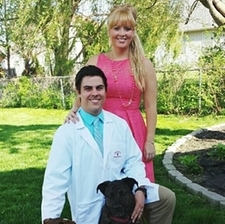 He graduated from the veterinary program at Ohio State University in 2014. Upon graduation he began working at Zeeland Veterinary Service where he focuses on surgery and dental care for your pet. In his spare time he enjoys playing golf, running, watching sports and spending time with his wife and three dogs. Enjoys the diversity that Veterinary medicine offers, but focuses on surgery and providing excellent oral health care for your pet. Dr. Meyers was born in Puerto Rico, grew up in Lansing and graduated from Michigan State University's veterinary program in 1998. She is fluent in spanish and obtained her certification as a veterinary acupuncturist and enjoys surgery. When not at Zeeland Veterinary Service, she enjoys taking care of small ruminants (sheep, llamas, goats). Most of all she loves spending time with her family, watching Lion's football, gardening and camping. Dr. Meyers is certified in veterinary acupuncture and also likes to work with goats and sheep. Dr. Reichardt is from the Spring Lake area and graduated from Iowa State University in 2009. 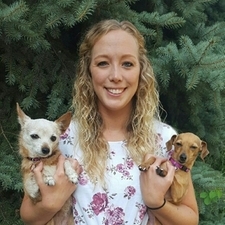 She began working at Zeeland Veterinary Service in early 2018 where she focuses on preventative care and internal medicine. Dr. Reichardt is an avid cyclist and competes in long distance bike races. While not on a bike she enjoys spending time with her family, her dogs Lyssa (left) and Kupffer (right), and her horse Finnegan. Enjoys all aspects of Veterinary Medicine, but focuses on preventative care and internal medicine in dogs and cats. Kaytlin is a Licensed Veterinary Technician and has been working at Zeeland Veterinary Service since graduation in 2015. As a technician her main focus is the safety of your pet while under anesthesia as she monitors them during their entire procedure. She also makes sure our laboratory machines are in tip-top shape. 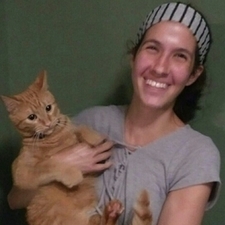 In her spare time Kaytlin enjoys reading, playing board games and spending time with her cat, Hobbes (pictured). 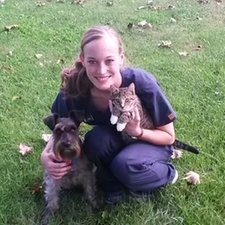 Enjoys all aspects of being a veterinary nurse, but her favorite part is providing safe anesthesia for your pet. Anna is a Licensed Veterinary Technician and joined the ZVS family in 2018. Anna graduated from Baker College in 2017 and has loved pursing this career ever since. One of her favorite parts about being a technician is cleaning up your pet's teeth during routine dentals, as well as greeting all of the new puppies. In her spare time Anna enjoys adventuring with her dog Bear, as well as camping with her husband and traveling the Upper Peninsula. Enjoys bringing out the white in every dog or cat's smile during teeth cleanings. 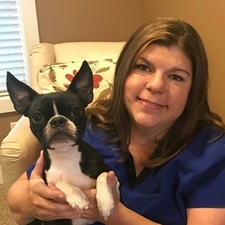 Billie has been working with Zeeland Veterinary Service as a receptionist since 2017. Formerly she worked as an assistant and receptionist at the Drenth clinic. The best part of Billie's job is meeting and greeting all the pets as they come into the clinic. In her spare time, Billie enjoys spending time with her family and dog, Mable (pictured). She is an avid reader and likes trail ride on four-wheelers. Favorite dog breed is the Boston Terrier. 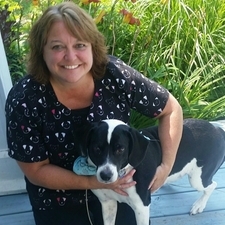 Marcy has been working at Zeeland Veterinary Services since 2014 as a receptionist and assistant. The best part of her job is seeing all the kittens and cats that come into the clinic. 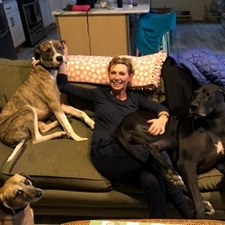 In her spare time Marcy enjoys raising orphaned kittens, spending time with her family, and cuddling with her two dogs (Lila on the right and Pixie on the left) and two cats. She also enjoys baking and makes the best brownies EVER! Loves seeing all the cute kittens and cats that come into the clinic. Raises orphaned kittens in her free time and makes the best brownies we have ever tasted! 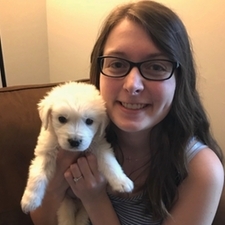 Holly has been working at Zeeland Veterinary Service since 2016 as a receptionist and assistant. Her favorite part about her job is seeing all the cute hound-dog faces (beagles are her favorite)! 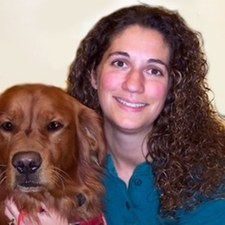 While not at the clinic Holly loves to spend time with her family and her dog. She also likes to garden, spend time outdoors and read. Favorite type of dog are the hound dogs (Really anything with Beagle in it). Loves to give treats to all the pets while they are at our clinic! 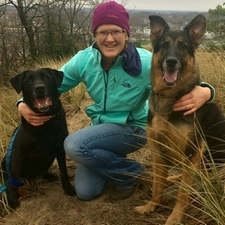 Betsy has been working at Zeeland Veterinary Service since fall of 2018 as a receptionist. Her favorite part of her job is saying "hi" to all of the pets and people that she sees. Favorite part of her job is saying "Hi" to everyone and every pet she meets. 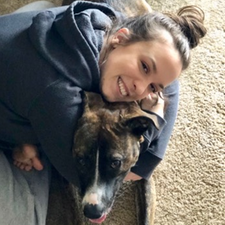 Grace has been working at Zeeland Veterinary Service as an assistant since the fall of 2018. Her favorite part of the job is making your pet's visit fear free. One of the things in her bag of tricks is squeeze cheese. Grace's second job is catering to the princesses that live in her house, Maggie and Mocha (pictured - we'll let you guess who is who). When not hanging out with the dogs, she enjoys running, kayaking, and going to the lake. Grace also is starting vet school at Mississippi State this coming summer! Enjoys making your pet's experience at Zeeland Veterinary Services as fear-free as possible. She's very liberal with her treat giving. Meet Erica! Erica jointed the ZVS family in 2018 as a receptionist. She prides herself in making sure that every pet and person has the best experience while at our clinic. When Erica isn't working she loves spending time with her family and dog, Molly (pictured). She currently is working towards her degree as a Licensed Veterinary Technician and is excited about caring for every pet like it's her own! Is excited about making everyones visit the best. Jessica has been working as an assistant at Zeeland Veterinary Service since 2017. Currently she is working on her veterinary degree at Iowa State University College of Veterinary Medicine (Go 'Clones!). 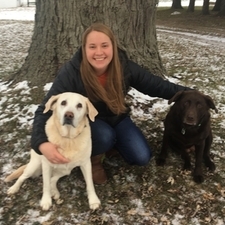 When not in school or at the clinic, Jessica enjoys spending time with her family and her dogs Bella (left) and Sierra (right). She also enjoys spending time outside hiking and camping.